The west Texas drillers that drove the shale revolution have overwhelmed the region’s infrastructure with oil production -driving up costs, depressing regional oil prices and slowing the pace of growth. The U.S. government continues to forecast the country’s oil output rising to fresh record. But competition for limited resources in Texas is making it harder for shale producers to turn a profit and encouraging some to invest elsewhere. Texas is home to the Permian Basin, the largest U.S. oil field and the center of the country’s shale industry. 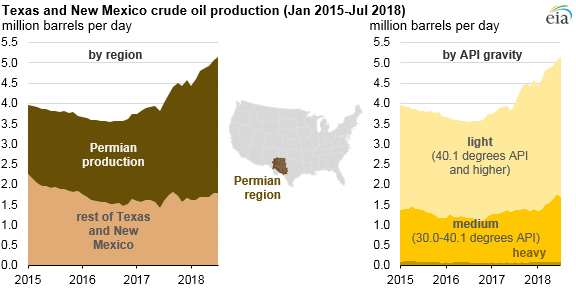 In the past three years, production from the Permian has risen a whopping 1.5 million barrels per day (bpd) to 3.43 million bpd. All that oil means pipelines from the shale patch are full, so producers are paying more to transport oil on trucks and rail cars. Some companies are reducing the scope of their operations in the Permian. ConocoPhillips (COP.N) and Carrizo Oil & Gas (CRZO.O) each moved a Permian drilling rig to another oilfield, and Conoco idled a second, the companies have said. Noble Energy (NBL.N) also has cut back on its well completions and said it is moving some drilling resources to Colorado. This reduces a littlebit the amount on the market? And the OPEC will react as soon as possible. Scientists told us... we are running out of oil in 2020. Do we? Yep. And a lot of logistic issues. DUCs, also called drilled but uncompleted wells. It is not the only problem there. West Texas electricity grid is buckling under the pressure of Permian Basin power usage. The electrical grid in West Texas "was not set up to withstand that much power going through it," said Marco Caccavale, a vice president at the oilfield services company Baker Hughes. I work in the Permian Basin in New Mexico. I can tell you that my company and other operators are drilling and reworking multiple wells. We truck since our wells and many others don't have pipeline access. Doesn't matter as long as prices are over $40 a bbl. Pointing to Conoco as any indicator of what happens in the Permian is not meaningful. The majors don't do anything that makes sense, but if operators move their rigs to different areas it is most likely due to a time frame issue. I.e. Lease expiration, Farmout obligations, etc. Moving rigs is not any indicator of what is happening in the field. Rig shortage is the biggest problem. 2014 was a disaster for the industry. Stacked rigs for long periods affect their integrity. That happened during the crushing low prices not that long ago. The industry is actually still getting back on its feet. As far as Noble goes, they were Clayton Williams and I have spoken to them myself a month ago. They may be holding off on operations due to financial issues. I wouldn't read much into what Noble is doing at this time. Also, it is possible that Noble can't find a completion unit. Ok. Why are oil prices on the rise if we have a surplus. Gas goes up overnight takes weeks to come back down. Yep. If so,how come gas prices are so high? Sometimes it seems that the price of crude and gasoline is lower in comparison, yet your local gas stations are posting higher prices. It takes time to reflect those lower prices as the supply of gasoline to your local area gas stations doesnt happen overnight. The gas your local gas station selling today may have been purchased and shipped a month or two prior to the time it is available in their UST to pump out of their two armed bandit! This is a very good thing for the USA and other countries at the same time . 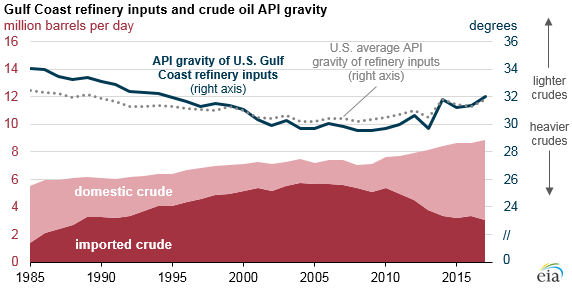 The density of crude oil processed by U.S. Gulf Coast refineries has become lighter since 2008 as refineries moved away from heavier imported crude oil to lighter crude oil produced in Texas. The Gulf Coast is home to most of the nation's petroleum refineries, and these refineries tend to run a diverse mix of crude oils that, similar to the national average, has become lighter since 2008. 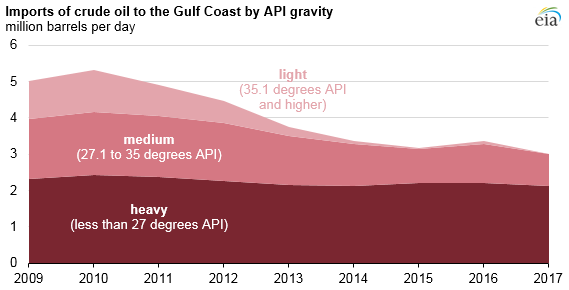 Most imports of crude oil to the Gulf Coast region are relatively heavy, as crude oils less than 27 degrees API accounted for 46% of the region's imports in 2009 and 71% of regional imports in 2017. Relatively lighter crude oil imports accounted for 21% of imports in 2009 but had virtually disappeared by 2017. In EIA's refinery operation surveys, the Gulf Coast region is separated into five refining districts: Texas Gulf Coast, Texas Inland, New Mexico, Louisiana Gulf Coast, and Northern Louisiana and Arkansas.